There’s a great deal to decode here. And as with so much interesting menswear, the key is context. Glancing at the above and you’d be forgiven for thinking we’re in emo rock territory. Some kind of Weezer or Jimmy Eat World stage clobber; grotesquely mid-90s and somewhere between a skeleton onesie wearing Arlington County misanthrope and Hugh Jackman’s Greatest Showman. 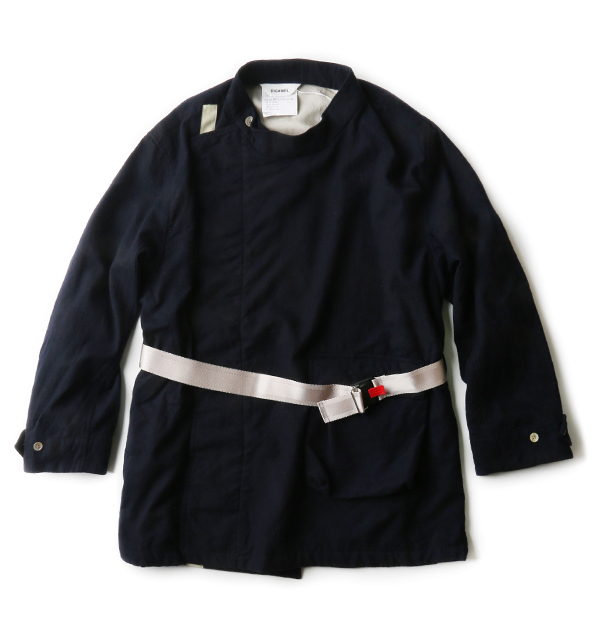 In fact this by Japanese brand Digawel, direct from their AW18 offering. 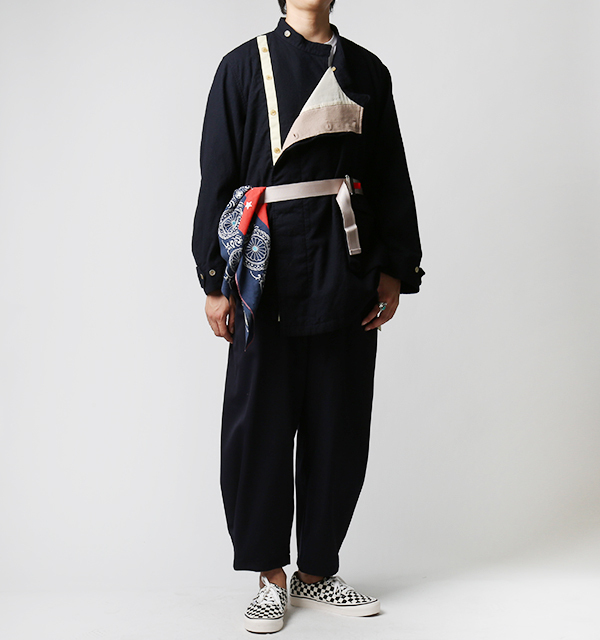 It feels a bit fey, provoking a vaguely androgynous mood – in opposition to most of the capital M menswear featured on this site. Or does it? Are we just blinkered by the cultural baggage of our western viewpoint? 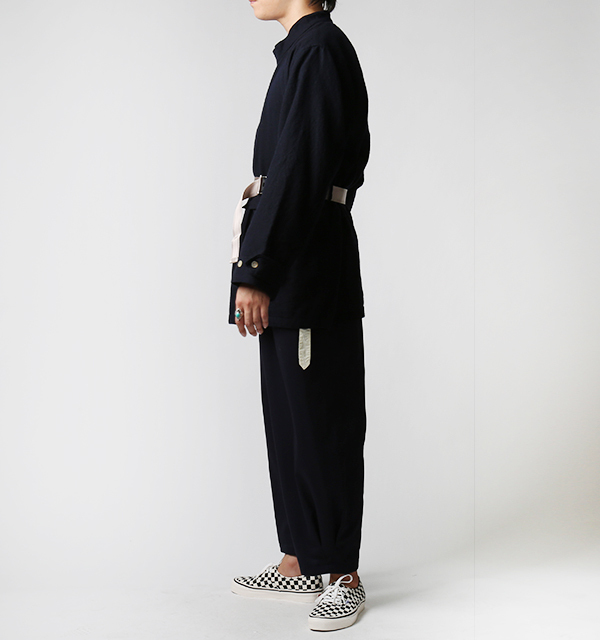 Does this silhouette, this theatrical selection of detail and fastenings become something else in the East? Have a look at the images and make up your mind. I have no idea why retailer Sculp Store chose to further confuse this already confusing piece with a tucked in bandana. This dude looks like a Georgian Duke sneaking out a bawdy house. The bandana is (in my view) unnecessary flouncery. The coat alone is madness enough. The asymmetrical fastening, with contract trim. The stand up collar. 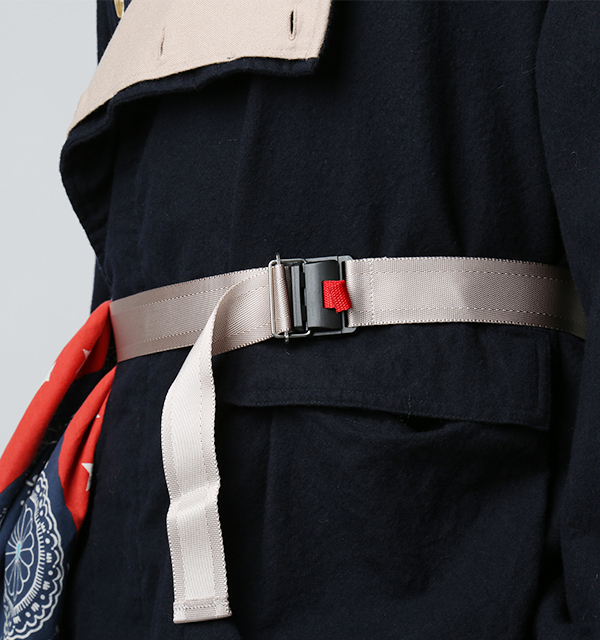 The contrast nylon belt. Any fucker in this is a proper Christmas goose, just waiting to be basted and cooked to perfection. Not sure I could pull it off myself. It reminds me a little of the stuff Folk used to put out in the early 2000s, all on-the-wonk fastenings and peculiar collars. Maybe it just looks a little too complicated. Maybe it;’s that belt – just a little too sashay. I dunno. For all my ‘what does it mean through a Japanese lens?’ protestations. I still think he looks like a vintage solider on a tin of assorted biscuits.